AUD keeps downward trend against USD, the pair remains within the current channel. Investors are focused on the night spike in the exchange market. The main movement was in USD/JPY, although today is a bank holiday in Japan. However, all pairs received a boost: so, "the Australian" fell against the American dollar by 200 points in minutes, but then, in a couple of hours, this was almost completely won back. Spike time, narrow market, and closed main exchanges, most likely, speak about a large player entering the market and a sharp increase in demand for the Japanese yen as a "safe haven". Today, attention should be paid to the US labor market. Despite the sharp change in price at the beginning of the day, nothing has changed technically: the pair continues to trade within the wide downward channel. After testing its lower border at 0.6770, the instrument will tend to 0.7020, 0.7050. After that, AUD will again decline against the strengthening USD. In the medium term, target levels are 0.6500, 0.6420. Support levels: 0.6790, 0.6905, 0.6850, 0.6790, 0.6770, 0.6600, 0.6500, 0.6420. 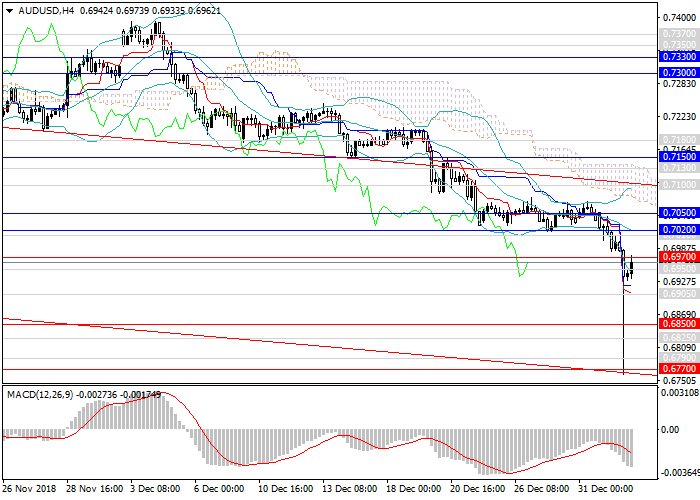 Resistance levels: 0.7020, 0.7050, 0.7100, 0.7150, 0.7180, 0.7300. Short positions may be opened from the current level with targets at 0.6770, 0.6600, 0.6500, 0.6420 and stop loss at 0.7090.